“The piano is a taboo. It must be destroyed” - Nam June Paik issued this demand during the early 1960s, and this is what the mild-mannered music lover first recalls with great concern when the term 'Fluxus' is heard. 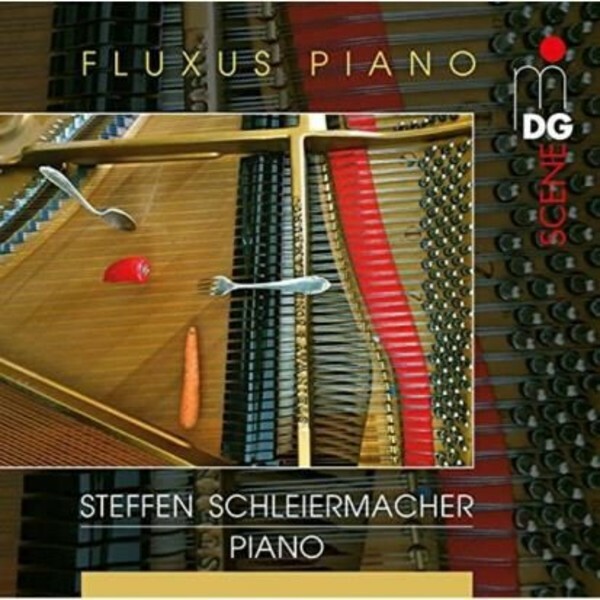 However, as Steffen Schleiermacher shows with a couple of friends on his latest CD, there is much more to Fluxus. With great seriousness, the Fluxists seek and find highly individual forms of expression, even on the piano. Along with reminiscences of Dada, miniatures are produced, surprising us even fifty years later with their unconventional view of music and sound. Fluxus concerts could be repeated, but what was included in the repertoire remained in flux. Steffen Schleiermacher’s selection contains some works by composers such as John Cage, Yoko Ono and György Ligeti that were performed at the International Festival of the Newest Music held in Wiesbaden in 1962. The Fluxus composers offered the performing musicians a great deal of freedom for making their own decisions. Whether the composition was limited to more or less specific playing instructions, as in Yoko Ono’s 'Overtone Piece' and Philip Corner’s 'Piano Activities', or had a difficult-to-interpret graphic score, as with Toshi Ichiyanagi or the master calligrapher Sylvano Bussotti, Steffen Schleiermacher has no equals when it comes to transforming cryptic sources into fascinating sounds.